"The Global 7000 business jet is a highly sophisticated, state-of-the-art aircraft, and we are pleased that our flight test vehicles have been showing a high degree of maturity," said Michel Ouellette, Senior Vice President, Global 7000 and Global 8000 Program. "Our test program's development and certification schedule is on track, and the addition of our third flight test vehicle is in line with our commitment for certification in 2018 as we accumulate more flight hours." FTV3, dubbed "The Navigator," will be used to test the aircraft's advanced avionics and electrical system performance. It is the first production aircraft to be equipped with a dual head-up display (HUD). The dual HUD significantly improves operational efficiency and safety, in good or poor visibility, while reducing pilot workload. The Global 7000 FTV3 took off from Bombardier's facility in Toronto today under the command of Captain Logan Lamping, assisted by his co-pilot Derek Thresher and flight test engineers Duane Moore and Matthew DiMaiolo. 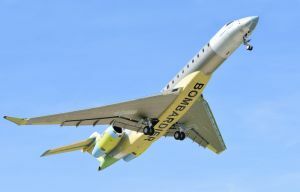 During the 2017 European Business Aviation Convention & Exhibition (EBACE) from May 22-24, visitors are encouraged to visit the Global 7000 mock-up at Bombardier's booth, located at Z110 at Geneva's Palexpo. The advanced wing design on the Global 7000 aircraft was conceived to optimize speed, range and control and ensure an exceptionally smooth ride. With its impressive long-range capability of 7,400 nm (13,705 km) at M 0.85, it can fly eight passengers non-stop* from London to Singapore or Dubai to New York City with a maximum operating speed of M 0.925. * A masterpiece of creative and thoughtful design, the Global 7000 aircraft's sophisticated styling and superior performance set the benchmark for the most exceptional business jet experience. To view the photo associated with this press release, please visit the following link: http://media3.marketwire.com/docs/20170510_FTV3_TakeOff2_HR.JPG. Bombardier's third Global 7000 flight test vehicle makes its first flight.